As the story spread like wild fire throughout the community, the residents [sic] annoyance spilled over, the five (5) men and a vehicle belonging to them were barricaded. 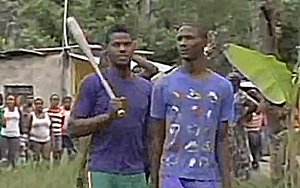 The five (5) men were rescued and escorted out of the community by police. Jamaica remains high on the list of countries in which homosexual acts are illegal and violence runs rampant against its LGBT citizens.